This is book three, so there might be tiny spoilers, but I’ll do my best. 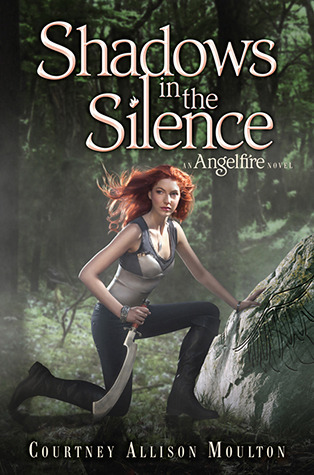 I can’t believe I’m writing a review for the last book in the Angelfire series. I have the most bittersweet feelings about this. If you’ve been following me for a while you know my love for Courtney’s writing and these particular characters. Shadows in the Silence picks up where Wings of the Wicked left off. If you’ve read my review of Wings of the Wicked you know how many feels I had for that book. There was SO MUCH going on. It broke my heart, it really did. Ellie is on a mission to find a cure for Will and she goes to one person she knows will be able to help, Cadan. Ellie will stop at nothing to save the one she loves, even dealing with forces of the evil. But is Cadan really evil? In order to save the world, Ellie will have to push herself beyond anything she could’ve imagined. Is she strong enough? Guys, I don’t even know where to start. I’m so conflicted about this review because I want to say so much but at the same time I can’t. I loved this book to pieces. Ellie stands as one of my favorite heroines in young adult literature right now. She’s strong and fierce. Real and emotional. She’s every girl and yet she’s not. I think Courtney created a persona that inspires and really pushes you beyond the norm. I have the utmost love for this series and these characters. I adored Cadan, Katie, Marcus and every other character Courtney penned on that paper. Seriously, it’s hard to pick just one thing that I enjoyed about this series. I can’t wait to see what Courtney will come up with next. I recommend these books to anyone who loves good writing coupled with a strong breathtaking romance and action that keeps you on the corner of your seat. You did well Courtney, you did well! Shadows in the Silence comes out January 29th, 2013.